Life was mostly a blank up until I turned eight. After November 1967, everything began. By then I’d laid the foundation of the “Daytalking, Nightwalking, Stargazing” person I am now. I’ll pass yet another birthday this Thanksgiving and all I’m thinking about is … how will I spend the next seven years? Here’s hoping they’re nothing like the first. People talk about five-year plans, but I like the idea of seven. You can use the “five-year plan” as the core, with a one-year ramp-up and remaining-year course correction, along with whatever new goals crop up. 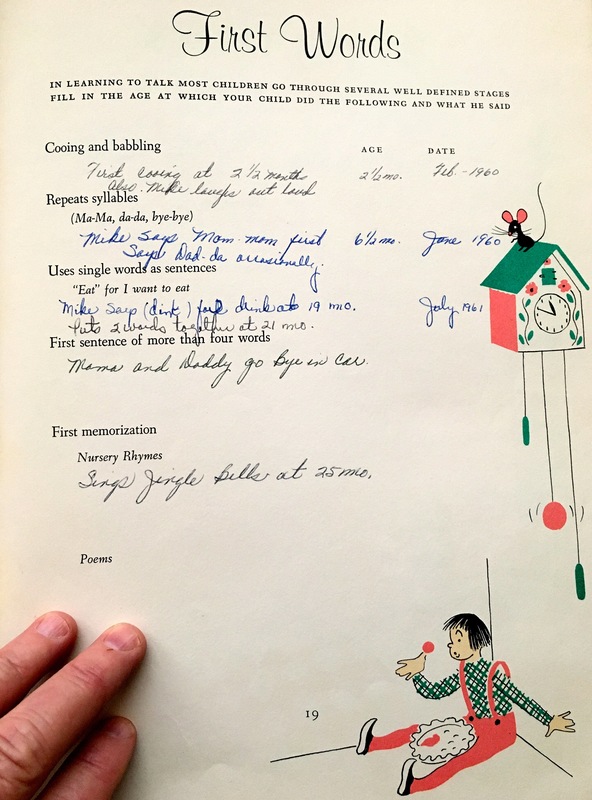 I stumbled across the “baby book” (above and at right) that my late parents received from a family friend after I was born (Who were “Mr. and Mrs. Frank Gierke?” They’re part of this story, too. I’ll have to do some digging). The book is pure twentieth century and I’m grateful for its treasures—a gift from my mother to me via the Gierkes. Maybe it’s something we can all do to reconnect with our original selves—a sort of gift to ourselves later in life. 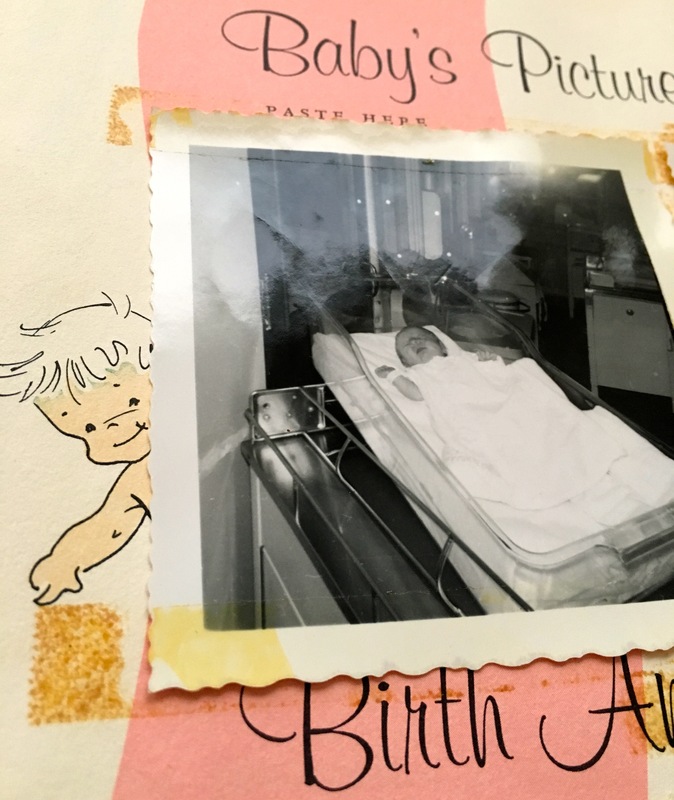 Based on this photo (at left), birth couldn’t have been easy. But it certainly got better. So let’s just go with that. I’ve been thinking about conversation, public speaking, and small talk a lot lately. I might be doing more of it in the near future. So “First Words” caught my eye. Of course a child says “Ma-ma” sooner than “Da-da” because toddlers traditionally spend more time with Mom. Also, breastfeeding. Who gives me the milk? Well, we all know how that turns out. But “Mama and Daddy go Bye in car…” Hrm. Guess we drove everywhere because it was Indianapolis, Ind. No one goes walkie-walks in that neck of the woods, at least in the early 1960s. “Jingle Bells,” is a memorable tune, so of course a kid is gonna memorize that. In February 1961 my mother had turned 26. She was gorgeous. I loved her beyond reason. My father? He seemed like a heavy cat, Mr. Danger Man. In the photo bottom left, I wonder what I was thinking. Dad has me in his arms, but I seem to be squirming away. He’s also pulled back a bit. We’re trying to negotiate who we are together. It’s the beginning of a long, somewhat edgy relationship. 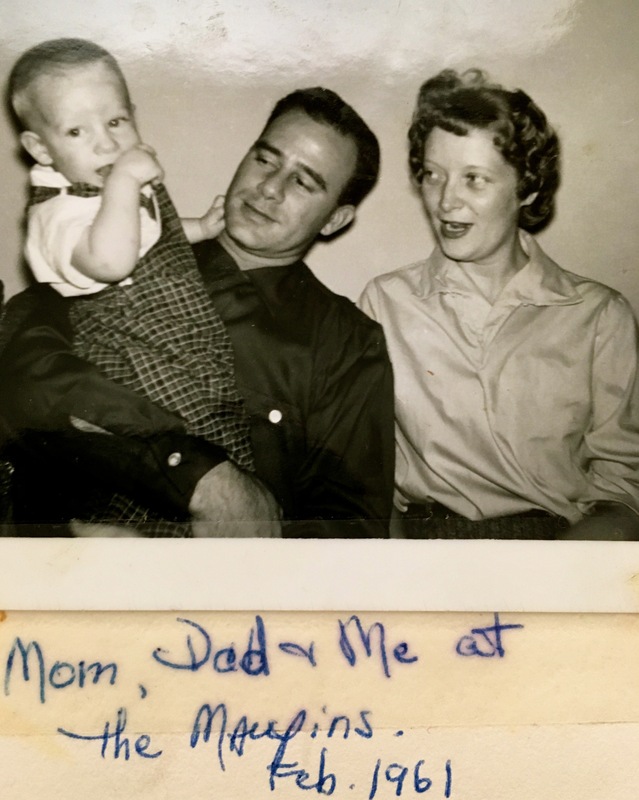 And I wonder about Mom’s caption to the photo: “Mom, Dad & Me at the Maupins Feb. 1961.” It’s interesting Mom puts herself before Dad. 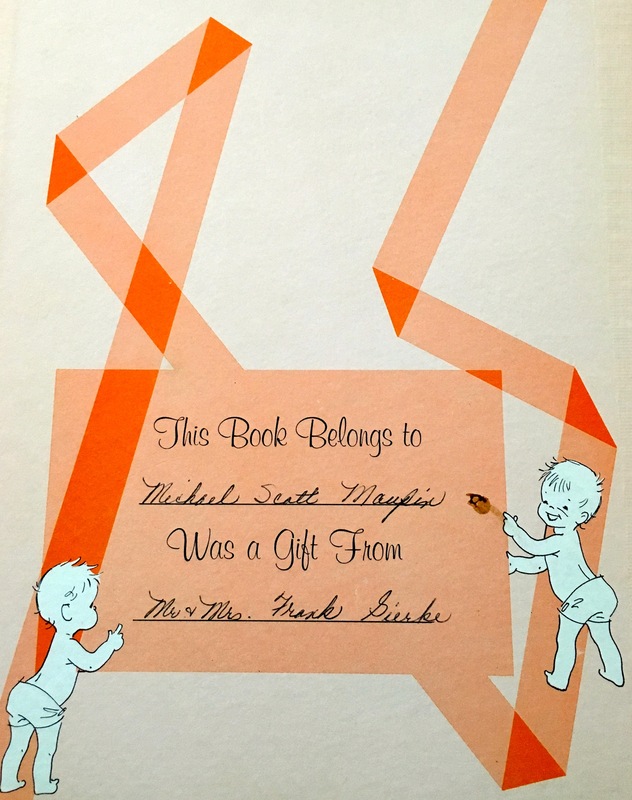 She was assertive, Irish, and the faithful author of this “baby book,” so she knew she had license to do as she pleased. I love the book for that. It’s like hearing Mom’s voice all over again, every time I open it up. Dad may’ve been the CEO of the Family Project, but Mom got to call the shots too. These days I’m thinking about gender roles. What does it mean to be an aging white male in early twenty-first century America? I wish I felt hopeful about that, but I don’t. Men have so much to learn from women, but there’s a major communication breakdown. To begin with, I probably wouldn’t have become a reader, writer, diarist, or wannabe musician without Mom. She was the one who set that tone. Dad was the taskmaster, but he also wanted to be an artist. It was his closet occupation, all the way up to the day he died. But wanting to be an artist and making art are two distinctly different things. The latter is a natural extension of who you are, other than wishing about it so you can become someone else. In that regard Mom was probably more of an artist than Pop. For my part, I’m not sure I want to be an artist, which confuses some people, not the least of whom is me. Modern artists have résumés, curriculum vitae, gallery showings, and followers on social media. My artist friends just make art. It comes from them organically and I acknowledge them as artists—even when I run into them shopping at Target. In seven years it will be 2024. I can’t even imagine. But adopting a seven-year plan (with the ramp up here, now, in 2017), would mean the five-year core begins in 2018, with solid strides toward a goal I wouldn’t have dreamed about in 1967. Back then my inner 8-year-old talked to a “mysterious other” in a Maryland backyard (Daytalking), moodily stalked the streets after dark with neighbor kids (Nightwalking), and went home to study National Geographic magazines about Jacques Cousteau, read up on American history, and pore over the Encyclopedia Britannica (Stargazing). 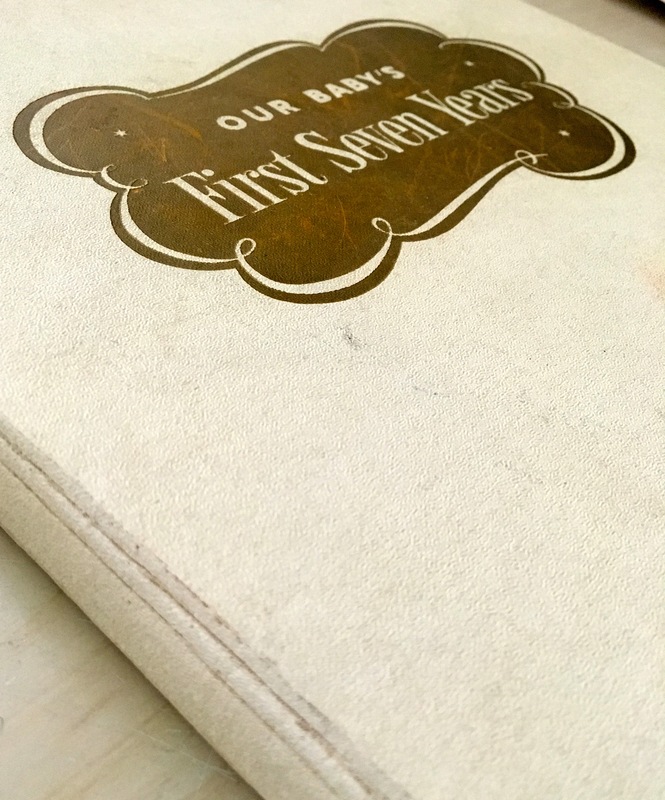 My first seven years remain the endless mystery. How would you do something like that? ~ by completelyinthedark on October 6, 2017.